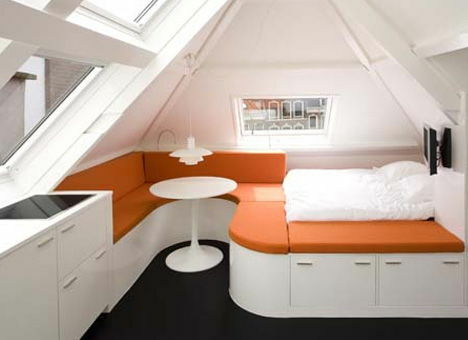 This micro apartment has only 30 square meters. Well, it doesn’t sounds too bad and you probably think you can work with it. But what if we add sloped roof to that equation? Now it doesn’t sound so good as before! But, they did it – Dutch architects from Queeste Architecten created this third-story apartment to be an autonomous floor. They tried to make the best possible use of low ceiling areas and when we saw the picture, we had to admit that they did good! More then good! They put all kind of storage in ever possible nook and cranny and the rounded corners give the place a sense of softness. Two persons can sleep here and you can even have guest because there is lots of seating space. This is the perfect example that you can make something special from any space, no matter how small the space is!